The home side won the toss and asked Whitburn to bat first and they were soon in all kinds of trouble, as Jonathan Wightman (3-10) and Sean Tindale (2-20) used the new ball well, to reduce them to 14-5 at one stage. Lee Crozier then cleaned up the tail with 4-9 off 3.4 overs, as they totalled just 63. South North soon made the runs required, scoring 64-3 from 16.5 overs. Chester-le-Street remain in second place, but lost further ground on leaders South North as their match was abandoned, while South North managed a win. They welcomed Tynemouth to Ropery Lane and the home side batted first scoring 207-9. George Harrison made 32, and Liam Simpson at seven, made a crucial 56 not out, despite Mark Watt taking 4-31 and David Hymers claiming 3-36. However, it was all in vain as the rain came in as Tynemouth were 7-1, from 2.2 overs and the game was abandoned. 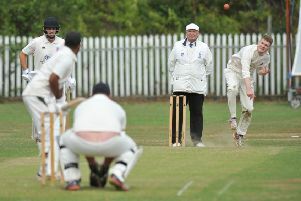 In the First Division, South Shields travelled to league leaders Burnopfield and lost by six wickets. Shields scored 178 all out, with Rupesh Borade making 45 and three players hit the twenties, but could not push on, Luke Elliott (20), Michael Dun (29) and Oliver Stedman (25). Lee Whitfield with 4-37 and Scott Steel 3-41 kept them in check. The home side then lost early wickets and were on 33-3, until Scott Steel steadied the ship with 73 not out and Gareth Breese with 64 not out, saw them home to victory, following a 85 run unbroken partnership. Boldon were away at Washington and were very close to victory, before the rain wrecked their hopes of a comfortable win. The home side only made 131 all out, with Jonathan Shakespeare claiming an impressive 4-30. Only skipper Ash Thorpe with 35 and Mark Watson with 29, showed any resistance late in the batting order. The visitors were 90-2, with Chris Ellison making 41 and Ian Pattison was 28 not out, when the rains came to spoil their party. Meanwhile in the Readers Durham Cricket League Division One, Whiteleas & Harton visited Durham City and scored 155 all out. After a poor start to their innings, Bilawal Iqbal made 35and Ray McRae 50, with Greg Parkin making a useful 26 not out. Danielle Hazell was the pick of the bowling, returning 3-24, while Paul Moralee and Cameron Fyfe each took two wickets apiece. City were 35-1, when the match was abandoned because of the rain. 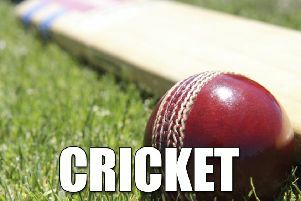 In Division Two, Evenwood travelled to Boldon CA and scored 227-5 declared, as Shahid Khan scored an excellent century (117no), with Luke Bannister scoring 42. Adam Crooks bowled well for the home side claiming 3-45. In reply, CA were 24-1 when the rain washed out play.